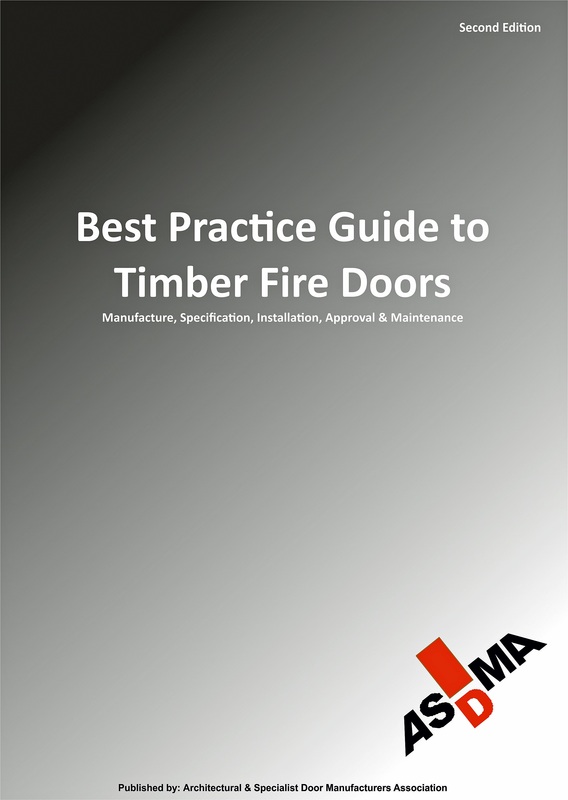 As the recognised voice of the timber door industry, ASDMA have released a second edition of the highly respected “Best Practice Guide to Timber Fire Doors”. “The Best Practice Guide is a vital tool for all those who are involved in the specification, procurement, installation, use and maintenance of timber doors, particularly when fulfilling a fire resistance function” said Ian Makins, Chairman of ASDMA. The guide is a unique reference, containing a concentration of expertise from within the industry made available for all those who rely upon the effective performance of fire doors in holding back fire and smoke. It is a source of comprehensive information in one document that has proven important for designers, specifiers, risk assessors, fire safety managers and building inspectors alike. Now ASDMA has extended and updated the content. Fire doors are an essential element in any fire safety strategy for buildings, and this guide will continue to be an important reference source to help in achieving robust performance against fire in combination with stylish interior designs. The Architectural and Specialist Door Manufacturers Association (ASDMA) is uniquely equipped to access data and consult with experts to gather information for this Best Practice Guide, on all the factors necessary for a successful fire door installation. The first edition was originally published in 2002, and ASDMA members recognised the need for a new edition to reflect recent changes in standards and regulations relating to fire doors. ASDMA commissioned Tony Palmer of Doortech 2000 to work on the revision. “As a renowned expert in our industry, we asked Tony Palmer to review and expand each section of the guide. Tony worked with guidance from industry and legislation experts and has included changes in perception, practice, standards and legislation and ASDMA members are very pleased with this latest edition” said Ian Makins. The Guide is intended to help specifiers, contractors, building control and fire officers, door manufacturers and installers on all the issues that have to be considered to satisfy UK Building Regulations. The Association provides representatives to speak on behalf of the custom-made door industry, on British Standard technical committees and the corresponding groups that develop European Standards. This is an ongoing process and ASDMA plan to keep the industry and specifiers abreast of future developments, with the latest of best practice advice. That includes, for example, providing a strong lead in explaining both the CE marking of doorsets and the continued essential role of voluntary third party certification quality performance schemes for door assemblies and installations which is so important for fire door supply in the UK market. The new ‘Best Practice Guide’ is available on at www.asdma.com/knowledge-centre.